About our Laser Tag arena. Our 2,400 sq. ft. custom themed arena resembles the streets of Cape Cod with a huge lighthouse prop, giant murals of the ocean and street signs. 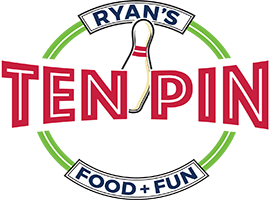 Find out all the details about the Laser Tag Party Package at Ten Pin Eatery. For groups of more than 20 people, please call or see a sales associate for more details. For youth groups, churches, and camps, please call or see a sales associate for more details. All prices are subject to change without notice. Any discounts or coupons may not be combined or compounded. One coupon per person. There are inherent risks associated with the use of or participation in or on any amusement attraction ride or device. Each guest accepts the inherent and other risks associated with their participation. NOTE: Any parties that include laser tag may have to share the arena with other guests. Wait times may occur. We reserve the right to merge walk-ins, birthday parties and group functions at any time, unless special circumstances with documentation occur.